*It’s common for opera composers to assign young male roles to female singers. Poor Dr. Faust (pronounced FOUST). He’s been a scholar for decades but has now become an old man with nothing to show for it. He doesn’t really know anything. He doesn’t really feel anything. He has no idea what the meaning of life is. And he’s entirely alone. Determined not to wait for death, he attempts suicide only to be distracted by a chorus singing God’s praises outside his door. Annoyed, Faust cries out that God can do nothing for him. Faust wants his youth back. He wants love and affection. God can’t give him any of those things. So Faust calls upon the Devil instead (what a brilliant idea). Immediately, the Devil appears in the form of Méphistophélès (meff-uh-STOFF-uh-lezz), a demon disguised as a wealthy gentleman. Faust explains he wants a chance to be young again (with maybe the added bonus of a few girlfriends), and Méphistophélès proposes a deal: all the youth and ladies Faust could ever want in exchange for his immortal soul. Faust hesitates, but when Méphistophélès tempts him with a vision of a breathtaking woman who lives close by, he’s sold. The two sign a contract and Faust is transformed into a dashing young man, ready to hit the streets. Faust makes the spectacularly dubious decision to invoke the Devil. Listen for Faust’s breathless, agitated phrases. Think about how his outbursts compare to Méphistophélès’s smoother, more even-keeled melodies and deeper tone of voice. (Bonus: Check out the “word-painting” technique used when Méphistophélès stretches his voice to its lowest extremes as he sings about the hellish place “là-bas,” or “downstairs”). In the nearby village, a young soldier named Valentin (vahl-ohn-TAEHN) prepares to go to war. Worried that his sister, Marguerite (mahr-geh-REE-tuh), will be left un-chaperoned, Valentin asks his young friend Siébel (syeh-BELL) to watch over her. Valentin says a small prayer that his sister will be kept safe (“Avant de quitter ces lieux,” or “Before I leave this place”). Listen for how this aria (solo song) is broken up into three sections: 1) a heartfelt plea with a plaintive melody, 2) a military march as Valentin preps himself for battle, and 3) a repeat of the first section with a few minor tweaks. But soon, Méphistophélès arrives to stir up trouble. In his aria “Le veau d’or” (“The golden calf”), Méphistophélès conjures up the image of a devilish idol that inspires Satanic dances and possesses the power to bring down the human race. Listen for the cymbal crashes and fluttering wind instruments (think piccolos, flutes, oboes, and clarinets) that give Méphistophélès’s song the sense it’s whipping into a devilish frenzy. After singing a song to entertain the locals, Méphistophélès teases Valentin and his friends by reading palms and predicting not-so-nice futures. The demon then proposes a toast in honor of Marguerite. Shocked that Méphistophélès knows his sister’s name, and sensing this stranger is up to no good, Valentin draws his weapon—only to have it shatter in midair. Valentin calls on God for protection from evil as the crowd disperses. Later, Faust urges Méphistophélès to introduce him to the maiden from the magical vision. Méphistophélès cautions that this particular lady may not be interested in Faust’s advances—she is, after all, none other than (surprise!) Marguerite, Valentin’s pious sister. Still, Faust demands to see her, and Méphistophélès orchestrates a “meet cute.” Faust turns on the charm, but Marguerite shies away. Attempting to speed the love affair along, Méphistophélès leads Faust to Marguerite’s house and leaves her a basket of jewels, hoping they’ll help Marguerite look more favorably on her new suitor. Marguerite checks out her new look in her aria, “Ah! Je ris de ma voir si belle” (which roughly translates as: “I’m laughing at how pretty I look”). Notice how she sings several notes in rapid succession (a style known a coloratura), to give the effect that she’s literally laughing. Her neighbor, Marthe (MAHR-tuh) interrupts her, and Marguerite is slightly embarrassed, but not half as embarrassed as she is when Faust arrives, complimenting her beauty and proclaiming his undying love. Méphistophélès distracts Marthe, leaving Faust and Marguerite alone. In no time at all, Marguerite reveals she’s just as smitten with Faust as he is with her, despite her concern that a whirlwind romance could bring her everlasting shame. (Marguerite may be innocent but she’s not stupid; she knows the other villagers won’t look kindly on an unwed woman who spends all her time with a young man). And yet, with a little coaxing from Méphistophélès, Marguerite agrees to be Faust’s girl forever. With no recent word from Faust, Marguerite sits nervously at her spinning wheel. Siébel arrives to keep her company, but his attempts to comfort her are in vain: She’s carrying Faust’s child, and there’s no ring on her finger. At this (very) inopportune moment, Valentin and his army come marching home from war. Having emerged victorious, Valentin is ready to celebrate with Marguerite, but soon discovers something’s gone very wrong in his absence (thanks for blabbing, Siébel). As Valentin goes off to confront his “disgraced” sister, Faust and Méphistophélès turn up at Marguerite’s door hoping to smooth things over, as Faust has been feeling remorseful about leaving his former love. But everything goes to hell (see what we did there?) when Valentin bursts on the scene, demanding someone take responsibility for his sister’s situation. A fight breaks out and Faust ends up stabbing Valentin. Faust and Méphistophélès disappear just as some villagers gather to see about the commotion. Marguerite rushes to her brother’s side, but Valentin pushes her away, claiming his impending death is all her fault and cursing her as he collapses on the ground. With nowhere to turn, Marguerite goes to church to pray. Once there, however, an unforgiving voice (which sounds mysteriously like Méphistophélès) declares that her sins have damned her forever. Sometime later, Marguerite has landed in prison. Her brother’s death and Faust’s abandonment have driven her mad, horrifically causing her to murder her newborn child. Convinced he’s loved Marguerite all along and that the trials and tribulations of the past few months were all the Devil’s doing (really, dude? ), Faust persuades Méphistophélès to help him break Marguerite free. But will Faust’s newfound sense of commitment be enough to save Marguerite before it’s too late? Can his love rescue her from execution? Will they both be able to escape Méphistophélès’s eternal damnation? By the time Johann Wolfgang von Goethe (GEUH-tuh, 1749-1832) began writing the epic saga that would inspire Charles Gounod’s (goo-NOH, 1818-1893) opera, the legend of Faust—the ultimate “deal with the Devil” story—was already a few centuries old. Indeed, German texts from the sixteenth century reveal “Doctor Faust” may have actually been a real doctor or magician who reportedly died a very strange, very gruesome death. The doctor’s bizarre bio eventually made its way into Germanic folklore (way before the days of the Brothers Grimm), where it was transformed into a cautionary tale about the dangers of asking too much out of life. Faust would later be immortalized by Shakespearean contemporary Christopher Marlowe in his play Doctor Faustus, and would enjoy even greater fame nearly two hundred years later thanks to Goethe’s massive two-part drama (a work that took him nearly 60 years to finish). Goethe’s version came with a twist, however: He was the first to introduce the character of Margaret (also known as “Gretchen” and referred to as “Marguerite” in French), the young woman Faust seduces and then discards. It was Marguerite’s side of the story that proved so moving it went on to influence a long list of nineteenth-century Romantic artists, including powerhouse composer Hector Berlioz (who wrote his own Faustian opera, La damnation de Faust), song master Franz Schubert, and Gounod, who became a fan of the Goethe story during a trip to Rome—a place filled with images of angels and demons. Faust’s tale continued to spark imaginations well into the twentieth and twenty-first centuries (think of movies like Damn Yankees and Bedazzled or more recent TV series like Lucifer or Chilling Adventures of Sabrina), and the term “Faustian bargain” has become a universal phrase meaning “to sell one’s soul.” The original Doctor Faust may have met a tragic end, but his legacy isn’t going anywhere anytime soon. Going to the opera means you’ll have to start listening in a new way if you want to take in everything the music and the voices have to offer. And guess what? This is less difficult than it sounds. Try thinking of opera singing as its own type of language or speech. When we’re speaking, our emotions can change the way our voices sound from moment to moment—and one word can have a thousand different meanings depending on how we say it (loudly, softly, quickly, slowly, with a high- or low-pitched voice, etc.). The same is true for the characters in an opera. Each voice you’ll hear will have its own special flavor depending on who the character is and what he or she is saying. Marguerite, for example, is an innocent and sensitive young woman. Her voice, therefore, will be on the higher side (to provide a clue that she’s youthful and inexperienced) and will occasionally soar above the orchestra with intense emotion (such as when she raises her voice in prayer or when she pleads with Faust not to break her heart). Faust, on the other hand, spends much of the opera as a young man with a tremendous appetite for fun. His bright tenor voice (a vocal type associated with heroes) symbolizes his youthful, reckless, and passionate personality. His melodies often pour out in short, explosive musical phrases that are meant to remind us of his lust for life. Watch for the ways in which the costume, lighting, and makeup designs help give you hints about each character’s status and their relationship to those around them. Do the costumes and lighting provide you with any clues regarding the characters’ personalities? Can you tell who’s “good” and who’s “evil” based on what they wear or what colors they’re associated with? Do you notice any shifts in how the characters look as their stories progress or their motivations change? In opera, supernatural and/or extremely powerful figures such as gods, demons, kings, or ghosts are usually sung by basses. Why do you think composers gravitate toward lower male voices when writing these characters? Do you feel the bass sound suits Mephistophélès? How so? The chorus plays an essential role in Faust. Why do you think Gounod opted to feature such a large group of men and women in so many scenes? What function do they serve? Can you recall any other theatrical or literary works in which a chorus is used in a similar way? 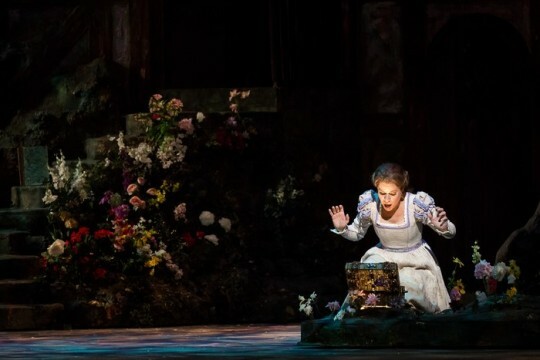 Though Gounod’s opera could be looked at as one big ethical fable, many of its themes and lessons come packaged in folk songs or serenades—miniature fables told by the characters as they sing of hypothetical stories that mirror their own. These include Marguerite’s ballad of the King of Thule (who dies for love), Mephistophélès’s satirical tune about a woman named Catherine (who must resist her boyfriend’s advances until marriage), and the soldier’s brief song about a cat and a rat (or a predator and his prey). Gounod’s not alone in using this trick. You probably know this already, but many artists—poets, painters, songwriters, you name it— choose to bury significant social messages in made-up tales about distant historical figures or even non-human characters (think Aesop) who speak in simple phrases or easy rhymes. Think you’re up for trying out the same tactic in the real world? If you’re comfortable, share the finished product with family and friends, or submit it to a local newspaper or regional poetry competition. See if your readers can uncover your hidden message and/or guess which real-life story inspired your sneaky serenade. 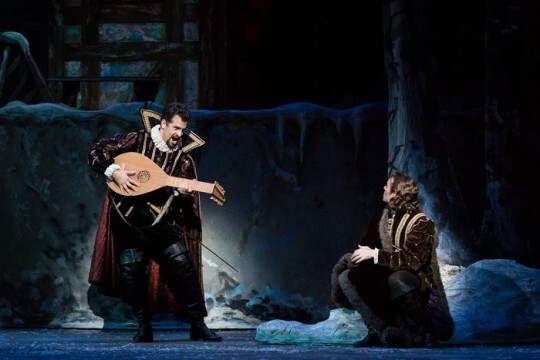 Opera A 400-year-old genre born in Italy that was cultivated throughout Europe from the sixteenth to the nineteenth centuries and eventually made its way to the United States (that’s right, Americans write operas, too). As you’ve probably guessed, there will be singing. Lots of it. Just think of it as heightened speech. A soprano may hit a really high note when she’s angry or scared. A bass might lay down a low note when he wants to be extra menacing. Charles Gounod’s Faust is just one of many musical pieces based on Johann Wolfgang von Goethe’s early Romantic masterpiece of the same title, and yet the opera is easily the most performed of those that were created for the theater. Though Gounod’s work (like several other Faustian musical pieces) focuses mainly on the love story featured in Part I of Goethe’s epic rather than on the more spectacle-filled Part II, the complex inter-personal relationships and killer tunes make it ideal for opera-going audiences. 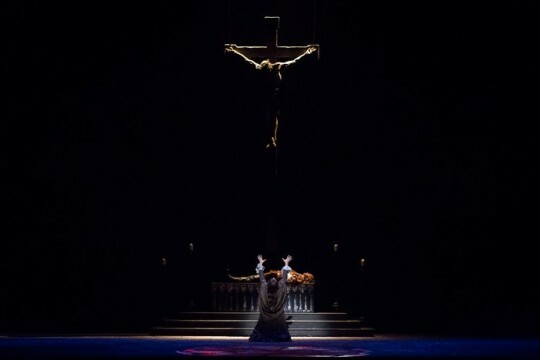 Gounod’s Faust doesn’t skimp on production values, either; it deliberately draws on many nineteenth-century French operatic traditions designed to pack a punch, including a huge chorus, a steady stream of elaborate set changes, and even a choreographed dance or two. While Goethe’s drama took decades to complete and represented a lifetime’s worth of knowledge and philosophy (and, incidentally, is largely responsible for his Shakespeare-level status in the German-speaking world), Gounod’s Faust has a slightly more modest history. Already a devotee of the original Goethe play by age 20, Gounod ultimately became interested in Faust as an operatic subject thanks in part to an 1850 play by author Michel Carré entitled Faust et Marguerite. The idea of centering the story on Faust’s ill-fated romance with Margaret (sometimes called “Gretchen” but known as “Marguerite” in French) likewise appealed to frequent Gounod librettist, Jules Barbier, who mixed together aspects of both the Goethe and the Carré plots to help create a sweeping melodrama wrapped inside a powerful moral fable. Originally only a mild critical success upon its debut in 1859, the opera gathered steam throughout Gounod’s life and today has earned a permanent place in the international operatic canon. Marlowe’s sixteenth-century version. Though originally a German folktale, the Faustian myth made its way to England fairly quickly and famously arrived on stage in Christopher Marlowe’s Doctor Faustus, an Elizabethan fantasy with a heavy dose of morality. 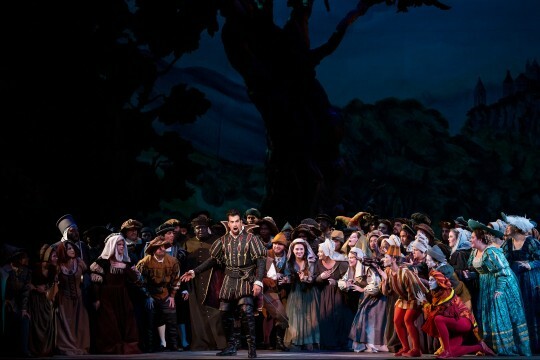 All photos by Lynn Lane for Houston Grand Opera. David M. Rubenstein is the Presenting Underwriter of WNO. This performance is made possible by the Kimsey Endowment; The Morris and Gwendolyn Cafritz Foundation and the U.S. Department of Education.